Peel the potatoes, cut in halves or quarters depending on size and boil in salted water for about 15-20 minutes or until they are easily "mashable" with a fork. Drain. Fry onion in the butter until translucent. Add the bacon or pancetta to the onion and fry until crispy. Add the wine and cook until reduced. Mash the cooled potatoes in a bowl with the chives and the crème fraîche (you can substitute 1/2 cup sour cream with a tablespoon of heavy or clotted cream if you can't find crème fraîche). Add the bacon/pancetta and onion to the potato mix and combine thoroughly. 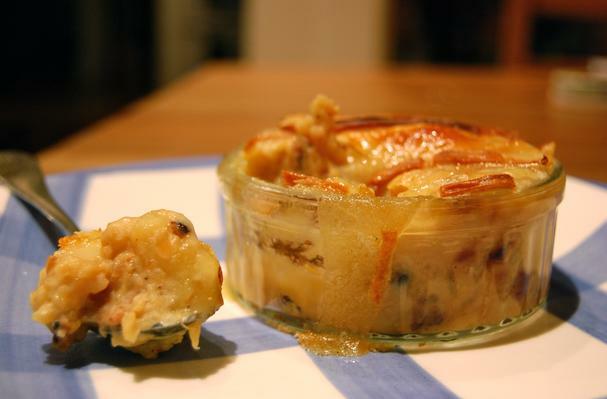 Place the potato mix in small buttered ramekin dishes and layer the cheese on the top. Bake for about 5 minutes at 425F, then broil on high until the cheese is bubbling and has formed a golden crust (about 2 minutes). Bon appétit! If you've never heard of tartiflette before, you're missing out! Basically a layered potato, bacon, cheese, cream and onion gratin, it's made with the nutty Reblochon cheese which makes it sinfully rich! I love the flavours of this so much and figured they would work well in a mashed potato dish. Much like a crème brûlée, you break the crispy cheesy crust to reveal soft, fluffy decadent mashed potatoes underneath. Heaven in a ramekin! PLUS, it was ready in about 30 minutes! Perfect for a cold winter night!